When most people think about trademarks, they probably think of marks like "Coca-Cola," "Kleenex" or other well-recognized brand names. But trademarks can be broader than just words and phrases. They can also be sounds like the Intel Chimes, videos like the MGM Lion Roar, and even pictures like the NBC Peacock. A trademark can be anything that acts as a source identifier. Legal translation: When you hear the Intel (bum, BUM, bum, BUM!) you know the company. When you see that scratchy, old lion roar, you know who produced the movie. And when you see the NBC peacock, you know you're watching 30 Rock (are there any other shows worth watching on NBC?). Along those lines, today's athlete trademark of the week is not a word or phrase, it's a picture. And if you can't get it from that, you're not trying. But if you need another hint, here's another of his marks with his team colors. Yes,it's Tim Lincecum, the 5' 11" pitcher. Despite his size, he can generate a heck of a lot of velocity. And given that he is a World Series Champion and two-time Cy Young winner, he is someone that needs trademark protection. Legal translation: After this, I guess you can say he has a "trademarked" pitching style. And his two marks are this week's Trademark of the Week. My hat is off to the artist for capturing Lincecum's unique pitching style in such a simple mark. Now, although he is receiving two trademarks, I did find it odd that Lincecum does not have any pending applications for "The Freak," (the nickname that arises due to his small size and unorthodox pitching style) which I think acts as a better source identifier. Legal suggestion: Hey Tim Lincecum, file a trademark application for "The Freak." What's the worst that can happen? I have to confess, Lincecum is my favorite pitcher, so of course, I recognized his silhouette in the trademarks instantly. I also agree with the Trademark Office’s decision to award him these trademarks. Legal translation: If you are familiar with Lincecum, when you look at those marks, you know who it is. It's a true source identifier. However, I was curious to see if others would recognize the mark as easily. Unfortunately, I polled two of the alleged sports fans in my office. Although I work with several smart people who are also baseball fans, they both failed. One even responded, "Hey, it could be any woman with long hair." And then he sent me the below mark with an email that simply stated "See? Hair." 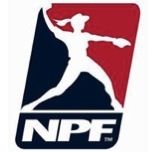 The National Pro Fastpitch league trademark? Seriously? 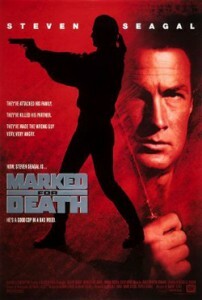 There's more similarity between Steven Seagal's silhouette in Marked for Death than the NPF. Maybe if you rotate it a little. No matter what, congratulations to Tim Lincecum on his eventual receipt of two trademark registrations. And also thanks to my colleagues because their failure to recognize Lincecum gave me the opportunity to surf the web for half-an-hour (at work) looking for the perfect silhouette of a man with a ponytail. Who knew it would be Seagal?